Trade, health, and intellectual property came together today as the heads of three specialised international organisations held an annual symposium to stimulate discussions on how the three can best help public health, and notably access to medicines in developing countries. The symposium, titled, “Public Health, Intellectual Property, and TRIPS at 20: Innovation and Access to Medicines; Learning from the Past, Illuminating the Future” is taking place at the World Trade Organization today. 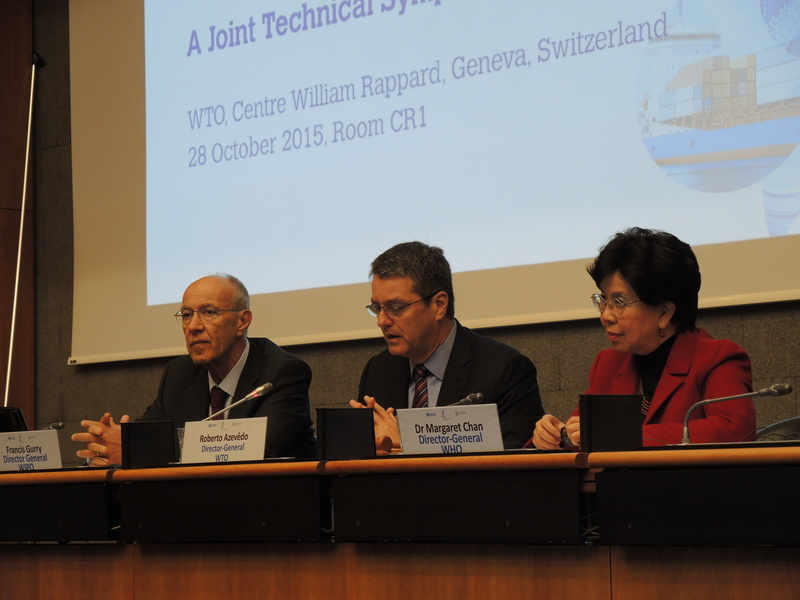 The WTO, World Health Organization, and World Intellectual Property Organization first launched the programme on trilateral cooperation five years ago. The draft programme lists panels presenting perspectives on: access to medicines; ongoing health challenges and policy responses and what the data say; the twin challenges of innovation and access – and leveraging IP to achieve both; and how to measure trade agreements’ impact on innovation and access to medicines. WTO Director General Roberto Azevêdo, opening the symposium, said there is increasingly close dialogue between the three institutions, which as member-driven organisations have common responsibilities in facilitating access to medicines. Trade and the multilateral system can help create a favourable public health environment and a more balanced and effective IP system, he said. The 1994 WTO Agreement on Trade-Related Aspects of Intellectual Property Rights (TRIPS), adopted 20 years ago, deeply impacted intellectual property rules over the world, he said, by introducing IP into the multilateral trading system. The TRIPS agreement is a very important tool for balancing needs between fair access to medicines and the necessary process of innovation, he said. Azevêdo: Adopt the TRIPS Amendment! Azevêdo underlined the 2001 Doha Declaration on the TRIPS and Public Health, and the additional flexibility to the TRIPS which was agreed by members in 2003, allowing countries to provide medicines made under compulsory licence to low-income countries that lack production capabilities. In 2005, this waiver of IP rights was approved as the first (and only) amendment to the TRIPS agreement. Two-thirds of members need to adopt the amendment for it to become effective, he said, adding that currently half of the membership has done so. Some 21 countries still need to adopt the amendment, said Azevêdo. He urged members to do so as soon as possible, and remarked on the fact that adopting this amendment requires no action, and no change in regulation. 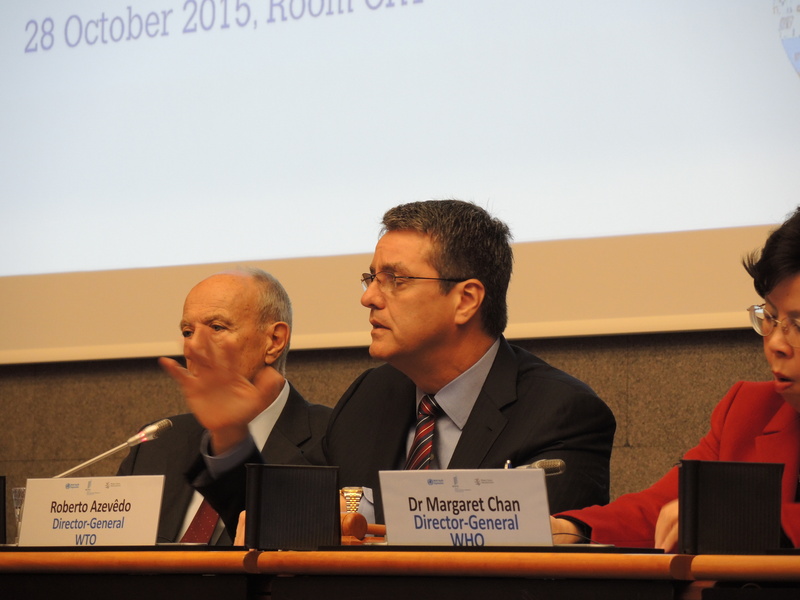 Some WTO committees are dealing with health issues, such as the caffeine labelling on products, he said, and some WTO disputes relate to health issues, such as tobacco plain packaging. There is a “tremendous pool of expertise” between the three organisations, he added, and the symposium is meant to spark new thinking towards establishing a stronger and more stable global framework for better and healthier lives. However, that cannot be achieved without the necessary research and new ideas. 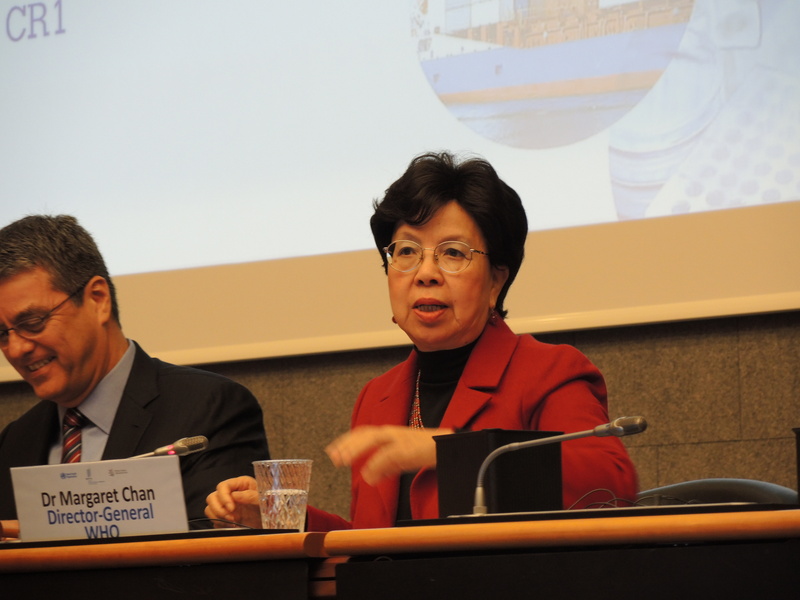 WHO Director General Margaret Chan said the purpose of patents is not just for the patent holder to obtain an economic return from market exclusivity. Patents should promote technological innovations and should also contribute to the dissemination of technology, she said, adding that according to TRIPS, patents are granted in the public interest. The TRIPS agreement leaves countries much flexibility to adjust patent rights to balance them with other important national priorities, said Chan. Today, most discontent about IP rights is grounded in the demand of wealthy countries for IP protection going well beyond the TRIPS requirements. Poorer countries are concerned about the “growing number of TRIPS-plus obligations that are embedded in new bilateral and regional trade agreements,” she said. New medicines have great potential benefits but access should be ensured, in particular affordable prices, Chan continued. Prices need to be high enough to keep companies on the market, as the private sector must make a profit. There is no other way around, they are not charity, she said. The right balance needs to be found, she added. She took the example of snake anti-venom medicines, which are a market failure but of great importance for some developing countries. She remarked on the attribution of the Nobel Prize in Physiology or Medicine 2015, which was divided between two researchers having discovered a novel therapy against infections caused by roundworm parasites, and for a researcher having discovered a novel therapy against malaria. Chan also remarked on the high prices of new drugs, such as drugs treating hepatitis C and cancer and the speculations on whether the new Trans-Pacific Partnership (TPP) agreement will affect the market for generics and biosimilars and the price of medicines. The high price of new medicines has raised very serious issues, she said. “No one questions the value of breakthrough innovation” on hepatitis C, with about 90 percent patients being cured compared to the previous regime, said Chan, however, the high price of medicines has stimulated the debate on issues of fairness. When member states ask her for advice, she said she asks them to scrutinise the provisions of trade agreements very closely for potential impact on access to medical products. She also advises that they beware of mechanisms for investor-state dispute settlement which might interfere with national legislation like tobacco. 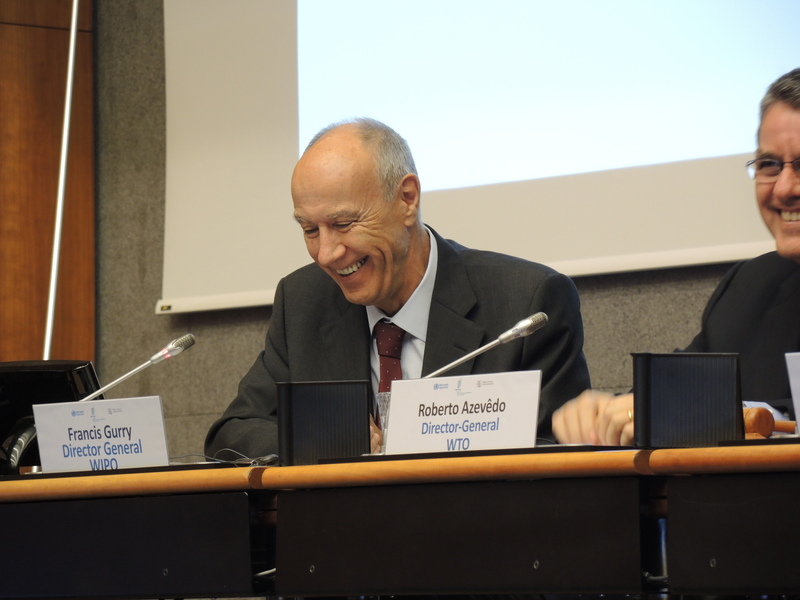 WIPO Director General Francis Gurry said the underlining policy challenge remains the same as it was 20 years ago but the context and the instruments at disposal are very different from those which existed then. In the same year the TRIPS was born, he said, commercial activity was permitted for the first time on the internet. “We are now much more in a data-driven world,” he said. The other main change in the world, he said, is the “very intense wave of globalisation over the course of 20 years.” There is a degree of complexity in policymaking that was not present 20 years ago, he remarked, and requires enhanced cooperation between state and non-state actors. Gurry said that from the intellectual property point of view, tension exists, revolving around access. On the questions of cost and access, to some extent some tension is constant and the only means of resolving it is through balance – encouraging investment in R&D and sharing the benefits of innovation. To illustrate it, he cited the 2012 annual budget of the United Nations as being some US$40billion, as compared to private giving in the United States amounting to over US$320 billion. “Spare capital does not exist in the public sector anymore,” he said, but it is in the private sector, indicating the importance of public-private partnerships. This is a consequence of the complexity of the world, he said, and the issue is that the international legislative framework is unable to respond through treaties to rapidly evolving challenges. "WIPO, WTO, WHO Heads Underline Need For Better Access To Medicines" by Intellectual Property Watch is licensed under a Creative Commons Attribution-NonCommercial-ShareAlike 4.0 International License.